A gateway between the two nations of the Iberian peninsula, Badajoz lies as close to Lisbon as it does to Madrid or Seville, and the city draws on influences from both sides of the border, as well as from centuries of tumultuous history, to form its distinctive character. Winding medieval alleys and a skyline dotted with palace towers make the historic town a sight to behold, while the remnants of the majestic Alcazaba watch over the city as they have for centuries, once an impenetrable fortress that protected the area from countless invasions. Opening hours: Stores are usually open Mon-Sat 9am-1:30pm and 4:30pm-8pm. The large department stores usually stay open a few hours later, especially during the summer months. 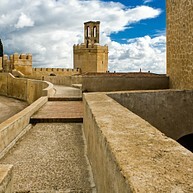 Badajoz proudly displays its history throughout the city's centuries-old buildings and monuments. The Alcazaba, Espantaperros Tower and Plaza Alta (the old town's main square) all showcase the city's Moorish influences, and great museums exhibit the prodigious contemporary artistic output of the region. 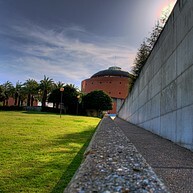 The city also boasts fantastic modern attractions and activities for visitors of all ages. Dating back to the 12th century, the imposing Espantaperros Tower was once the Alcazaba's most important watchtower, and today looms over the city from a height of 30 metres and offers some of the best panoramic views of the city. 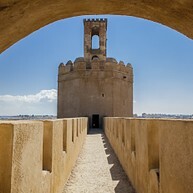 The Alcazaba of Badajoz is the city's historic fortress that once served as the home of the Taifa kings. As the city's former defensive structure, it is surrounded by several towers, as well as the Guadiana River, much to the visual delight of visitors. The Museo Extremeño e Iberoamericano de Arte Contemporáneo (MEIAC) is a fantastic museum and cultural space that transcends borders, connecting Spanish, Portuguese and Latin American artists, highlighting those from the Extremadura region. 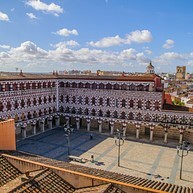 Plaza Alta is the beautiful main square in Badajoz's old town, an open public space surrounded by lovely buildings that showcase the city's Moorish architectural influence. The surrounding area is also home to numerous cafes and restaurants, making it a great place to stop for a meal or coffee. A great place to escape the oppressive summer heat is the wonderful AQUA Badajoz. Pools, slides, snacks and other fun aquatic activities for children and adults alike await at this fantastic water park. Centro de Ocio Contemporáneo (or COC for short) is perhaps the city's premier art space, an place where theatre, dance, concerts and other types of performances take place. Catching a show here is without a doubt the best way to get to know the city's contemporary and alternative artistic output.